This baby quilt is pieced in a derivative of the pattern Prairie Queen. It is roughly square with nine colored blocks separated by lattice strips. Backing is combination of plain white and polka-dotted cotton. Mostly hand-pieced and -quilted with a machine-stitched binding. 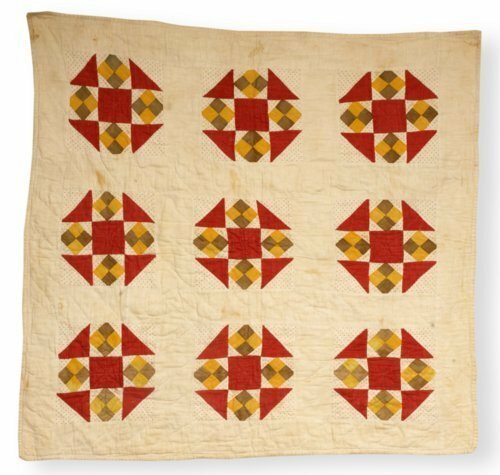 Mary Carl (1865-1943) made this baby quilt in Parsons, Kansas, probably for her only grandson, Carl Hunter, born in 1911.